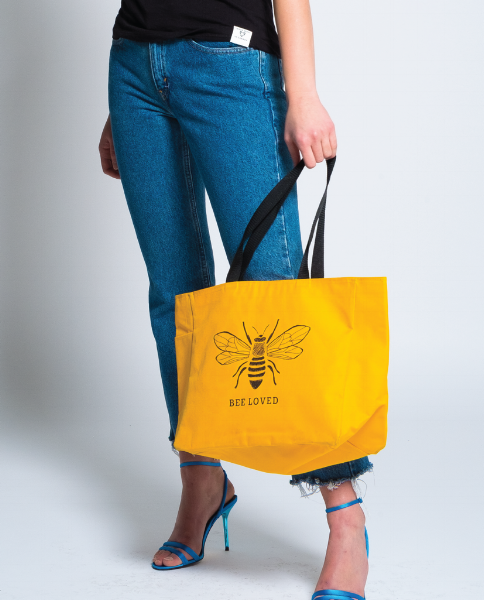 Preloved & Bee City Canada are joining forces to create a campaign that brings more pollen, nectar and love to the world. Pollinators need our help. 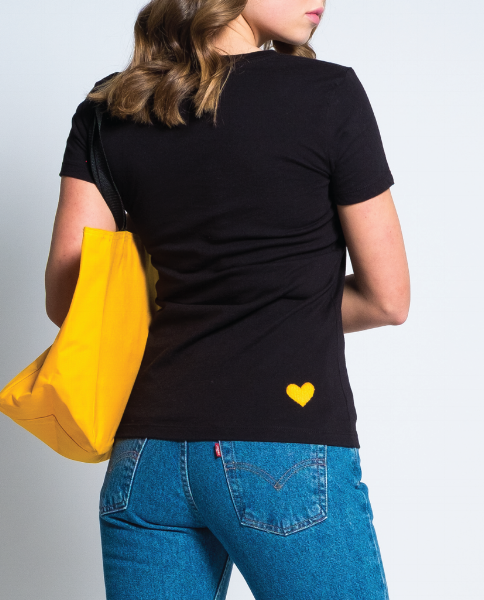 Designed in Canada, a dollar from every Bee Loved tee and tote sold will go directly to Bee City Canada to inspire all Canadians to take positive action. Get yours at www.getpreloved.com! Honey bee colonies around the world are dying at alarming rates, but did you know that native bees are also in serious decline? Can we do something and reverse this alarming trend? Yes, we can! 1. Support pollinator friendly farmers that do not use pesticides. The food we choose to eat has a direct impact on pollinator health and large industrial farms are not a healthy place for pollinators. Shop local, get out to a farmers market and choose organic! 2. Grow your own vegetables in your backyard or a community garden (save money, eat food grown by your own hands and feed the bees). 3. Plant pollinator-friendly plants in your yard or on your balcony. Choose native plant varieties, planted in clumps of three or more, in a multitude of colours (bees love yellow and purple!). Many plants sold in big box stores and nurseries contain pesticides that harm bees so, make sure to ask before you buy! 4. Be messy and lazy in your garden. If you have grass (no food for pollinators here! ), mow it less frequently and learn to love the clover and dandelions that may sprout up (bees love these plants). Leave undisturbed, bare patches for the ground nesting bees and a pile of twigs, branches and dead leaves in a corner for the bees to hide. Don’t cut down the stems of your flowers or raspberries in the fall. This is where some species of bees lay their eggs. Wait until late spring, when the new bees will have emerged. Bees need water, so put some in a shallow dish with a few pebbles. 5. Enjoy your garden and watch these incredible insects pollinate and give life to the earth. Invite some friends over to enjoy a glass of wine and share your gardening stories. Let our backyards be the playground for pollinator lovers! When you plant, they will come! Are there many types of bees? Yes, there are 800 different species of bees in Canada and more than 20,000 species worldwide! Only seven of these species are honey bees, one of which is found in Canada. If there are so many types of bees, why do honey bees get all the attention? Honey bees have been a part of European culture for centuries. They were brought to Canada by settlers in the early 1800s for making honey and wax for candles. Today, they are managed much like farm animals and many commercial beekeepers make their living by servicing their hives to large industrial mono crop farms to pollinate crops. When honey bees colonies collapse, the livelihood of beekeepers and farmers that depend on them is affected. The way many large commercial beekeepers operate is stressful to the bees and helps to spread diseases. For example, 80% of all honey bee hives in the United States are transported across the country to pollinate almond trees in California. Once the almond blooms have fallen off the trees, the honey bees need to be shipped elsewhere. While our modern industrial agricultural model may allow farms to produce cheap foods, these can be laden with pesticides, which are unhealthy for us, the soil, the plants and the bees. All bees, like us, need to eat every day and forage on a variety of different plants that are free of chemicals. Native bees were here long before honey bees arrived and they get a gold star when it comes to pollination! Bumble bees, for example, are the only bee that can pollinate tomatoes. Many other native bees are specialists at pollinating certain plants, like squash or alfalfa bees. 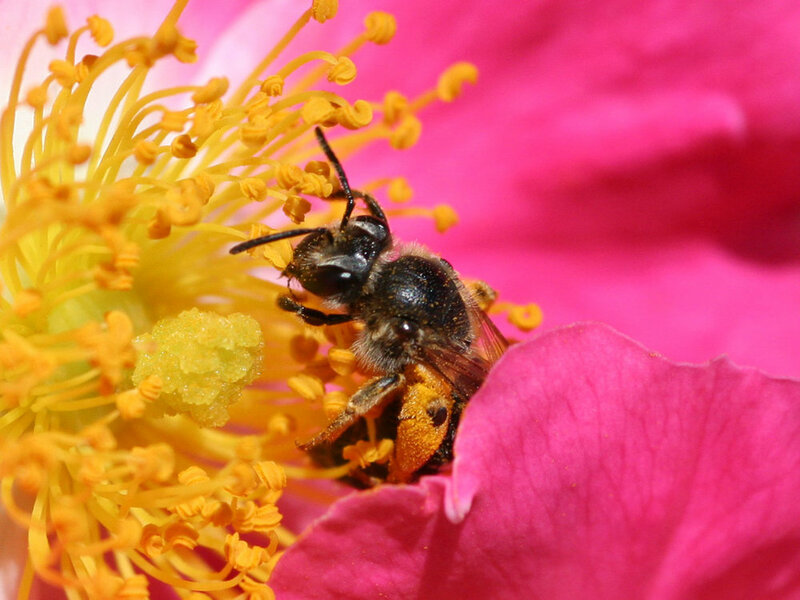 Unlike their wasp cousins, native bees are herbivores, relying solely on pollen and nectar from flowers. When you get a chance, take a close look at their fuzzy bodies, which are so cute! Do native bees live in hives? Well, this may surprise you but, they actually live in our backyards. Most live a solitary life, nesting in small holes in the ground. Others nest in the cavities of pithy stems and in small holes in wood. They don’t stray too far from their nests, spending their entire lives looking for pollen and nectar in or near our gardens. Why are bees so important anyway? Bees are called the most important pollinator because they are so good at it! Their fuzzy bodies are perfect for collecting pollen, the male part of the flower, while searching for sweet nectar. 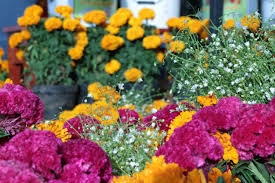 As they move from flower to flower, the pollen on their body brushes against the stigma, the female part of the flower, and voila, a seed is born. That’s right folks, pollination is about sexual reproduction in plants and it’s the bees and other pollinators that make this happen. Pollination is the oldest love story on the planet, over 125 million years old. Bees evolved with plants, developing this most beautiful relationship. Flowers use their scent and sensuous colours to lure the girls in (that’s correct, most pollinators are girls!) to pollinate. In return, the bees get the nectar and pollen they need for food. What would happen without bees and other pollinators? 75% of flowering plants on the planet depend on pollinators to reproduce. Without them, the planet would look like a desert, with a few pine trees and ferns scattered here and there. All wildlife that depends on plants for survival would also disappear. Let’s just say it wouldn’t look pretty! 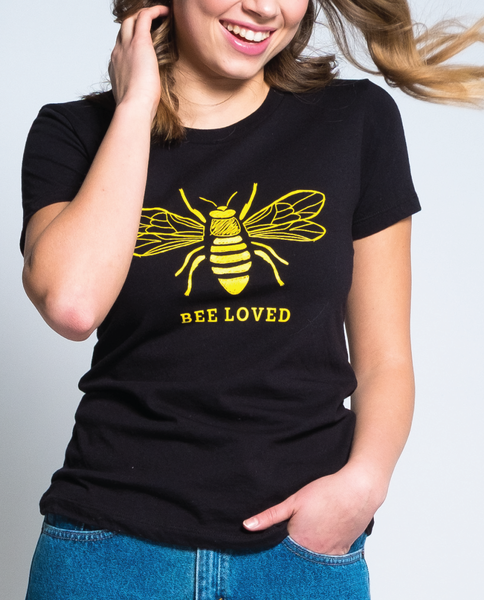 Support Shelly and her mission to help the bees! Shelly is the Director of Bee City Canada. Bee City Canada’s mission is to inspire cities, towns, First Nations, schools, businesses and other organizations to take action to protect pollinators. THE BITE: DID I HEAR CHOCOLATE?